Two advertising types fall in love even though they’ve never met and an ocean separates them. There must be more than a few non-loathsome people in ad work, but from fiction like this, you’d never know it. The big firm here is a hotbed of suspicion and bitchy intrigue, not the kind of place you’d imagine its two basically goodhearted protagonists spending their days. The London half of the love equation is Suze Wilding, a designer, now 32 and somewhat at a loss romantically and professionally, so it’s little surprise that she jumps at the offer to do a job (and apartment) swap with an account executive in the New York office. The All-American Lloyd Rockwell can’t wait to get to London, either, though he’s a little disappointed that his controlling girlfriend Betsy wants to tag along. At first, everything goes swimmingly and each is delighted with the change of scenery (though homemaker-challenged Suze definitely gets the better of the apartment swap, thanks to Betsy’s manic decorating and cleaning), Suze getting a hot boyfriend in gadfly party promoter Nick Bianco and Lloyd just enjoying the Britishness of it all. Fate intervenes when a rather overexplained plot of corporate subterfuge enlists an unwitting Suze (not the brightest) in getting Lloyd summarily fired. Meanwhile, Suze finds out that Nick just might not be as dreamy as he seems, and Lloyd starts realizing (long after the reader has) how truly unpleasant a girlfriend Betsy is. In order to salvage Lloyd’s career and Suze’s soul, the two come together to work some ad magic on their bosses, and in the process of their lengthy phone conversations, spark up a friendship with promises of love. While hardly revealing any great depth to her main characters, Sisman nevertheless makes them into real people and not the clones of most chick-lit of this sort. 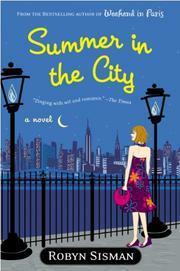 Light urban romance no less enjoyable for its predictability.